Decoding secret messages is a plot device in some mystery novels. In real life, it can mean the difference between life and death. In Bram Stoker’s 1897 Gothic novel, “Dracula,” law clerk Jonathan Harker writes in shorthand to his fiancée back in England. He suspects he is a prisoner in Count Dracula’s Transylvania castle. Dracula, cannot decipher the shorthand, which is a system of symbols used to take notes rapidly by hand. He intercepts them before leaving for England. Harker remains at the castle, at the mercy of Dracula’s “brides,” until Harker escapes. The 2004 children’s art mystery, “Chasing Vermeer,” by Blue Balliett, used a pentomino code. Two sixth-graders, Calder Pillay and Petra Andalee, work to break the code so that they can recover a stolen Vermeer, “A Lady Writing.” A code is hidden in illustrations throughout the book. A pentomino is one of the 12 plane figures that can be formed by joining five squares together side-to-side. The 12 different pentominoes are named after the letters of the Latin alphabet they resemble. “Code talking, however, was pioneered by Choctaw Indians serving in the U.S. Army during World War I,” according to Wikipedia. They served alongside the British during the second battle of the Somme in 1918. During World War II, Philip Johnson proposed using the Navajo as code talkers to the U.S. Marines. He was not a Navajo, but grew up on a Navajo reservation as the son of a missionary, and he spoke their language fluently. “Johnson’s report stressed the complexity of the Navajo language and the fact that it remained mostly ‘unwritten’ because an alphabet or other symbols of purely native origin did not exist,” according to the U.S. National Archives and Records Administration. Plus, the languages of Native American tribes varied so greatly that one tribe could not understand another. 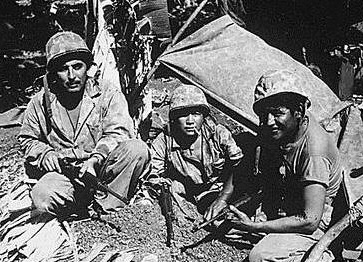 It’s estimated that about 400 Native American Marines acted as code talkers for the U.S. Marine Corps. Some of the Navajo translations were verbatim. Others “were Navajo terms that had been imbued with new, distinctly military means in order to compensate for the lack of military terminology in the Navajo vocabulary. For example, ‘fighter plane’ was called ‘da-ha-tih-hi,’ which means ‘humming bird’ in Navajo, and ‘dive bomber’ was called ‘gini,’ which means ‘chicken hawk,’ ” according to the U.S. National Archives and Records Administration. Some who served alongside these “walking secret code talkers” credited them in the Marines’ success in taking Iwo Jima. But the program went unrecognized until it was declassified in 1968. President Ronald Reagan gave the code talkers a Certification of Recognition in 1982. In 2001, the first 29 code talkers received the Congressional Gold Medal. Other Navajo, who later qualified to be code talkers in WW II, were given the Congressional Silver Medal. The Japanese had attempted to decipher the code after they captured a Navajo sergeant, Joe Kieyoomia, in the Philippines in 1942 during the Bataan Death March. But Kieyoomia had not been trained in the code talk. Efforts to “persuade” him failed. The spoken code was never cracked. Great post, Judy. This is an excellent example of how powerful words and language (and knowledge) can be, even in the face of horrific modern weapons of war. Ironic really, Charles. If the Navajo were treated like the Oneidas and Onondaga, who I used to live near, they were punished for speaking their native language. In some cases, Native American children were often removed from their parents to assure that they did not continue their cultural practices and language. Fascinating post, Judy. Thanks for the mini-history lesson. Thanks, Paprika. I love the bits of history that can’t be found in our history books. While I’ve heard about this before, I read an article about it at our school inservice on Friday. Then I came home and researched it more. I love your link from Dracula and shorthand to the Navajo code talkers, Judy. What a treat this was: I have learnt something new and revisited one of my favourite authors, Stoker. Lovely post! From you, Kate, that is the highest compliment. I’ve admired your story telling for some time now. I learned shorthand in business school and was fascinated by the mention of shorthand in “Dracula.” It turns out that Isaac Pitman developed shorthand in 1836, 61 years before “Dracula” was published. Ah! I’m an old secret code man from way back! I can remember mailing in Ovaltine labels and sending away for my Captain Midnight decoder ring back when I was a TV serial-crazed young ‘un. And I got a tremendous charge when I first saw said ring referenced in A Christmas Story. The Adventure Of The Dancing Men is still one of my all-time favorite Sherlock Holmes stories, and one of the best secret code stories ever. I was familiar with the Navajo code talkers, but always enjoy reading about same and picking up more details. In a larger sense, it’s always seemed to me to be a great example of how every individual or group has something unique to contribute to the common cause. Good reminder, too, that we shouldn’t be quick to write off ideas or customs we don’t understand. Everyone has something to bring to the table, and one never knows when it might be vitally needed. Mark, I also believe that “everyone has something to bring to the table.” It’s unfortunate that some folks don’t – or won’t – recognize this. 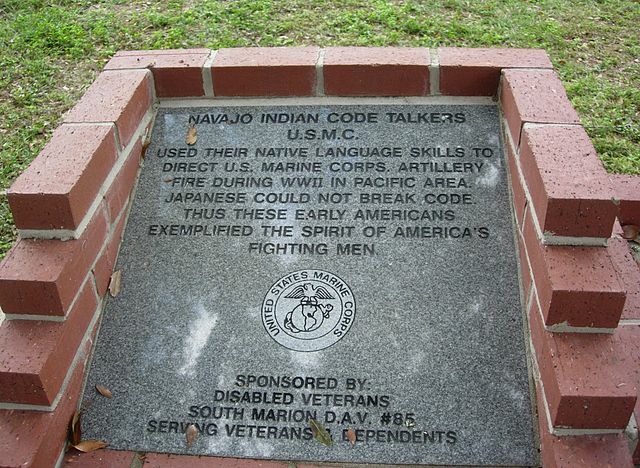 While I heard of the Navajo Code Talkers before, I did not know that the Choctaw Indians served as code talkers while serving in the U.S. Army in WW I.
I also remember the Captain Midnight decoder rings and Ovaltine. Great fun! “A Christmas Story” captured that time perfectly. Thank you for your kind comments. I had never heard about this interesting piece of history. I am familiar with speaking in code as it relates to teen-speak, but that’s another code all together–and one I’ll never crack. Excellent post! I grew up in southeast Kansas and had a pen pal in Oklahoma. Her Navajo grandfather told her about the code used in the war, and it was a point of pride for her…and awe for me. Thank you for sharing this. I also loved hearing about the code talkers, but I’m not sure why it was classified information for so long. Thank you for visiting my post and sharing your comments. Very nicely written post, Judy. I find it interesting, as I was not aware of these facts. You have done a great work with this post. It’s the little stories that aren’t in history books that intrigue me the most. Thank you for your comments, Arindam.